How to make a wrapped loop connection to join beaded jewelry items together. 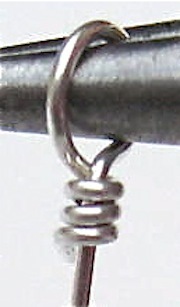 A wrapped loop is a strong connection used for beaded glass jewelry and other hand made jewelry pieces. Done properly, this loop will enhance your beaded jewelry items and be much stronger than the open type of loop as used on an eye pin. You will notice that this loop is seen frequently in glass beaded jewelry and art glass jewelry designs. 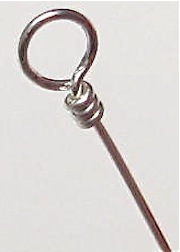 It is made from a single piece of wire and is quite often found in earrings. It is not difficult to learn and is very quick to make, but it will take a number of tries to get it right. 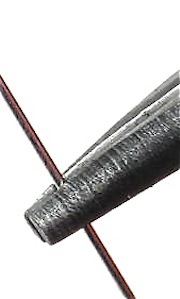 Use light 24 gauge wire to practice with as it is easy to handle. 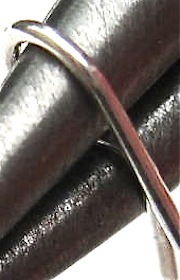 Take a piece of wire about 7-8cm long, grip it about two thirds along with your chain nose or flat nose pliers. Bend the short end of the wire down to form a right angle. Swap the wire over to your chain nose pliers and hold it at the bend. Holding the wire with your round nose pliers push the short wire up and around to form a part loop. 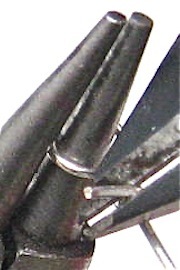 The short wire should now be pointing down alongside the longer leg. 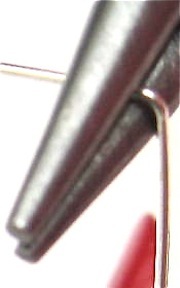 Now, push the short leg under the nose of the pliers to form a loop as per the photo. You should have a loop and the long leg still pointing downwards. Grip the end of the wire with your chain nose pliers (use your fingers if it is easier) and begin to wind the wire around the other leg. Continue to wrap until you have completed a number of turns. Use your side cutters to cut the extra wire from the wrap. Use your chain nose pliers to tuck the cut end against the leg. This is the completed wrap. With patience, all your wraps will look like this. There are a number of tools available that are designed to make loop forming easy and uniform. 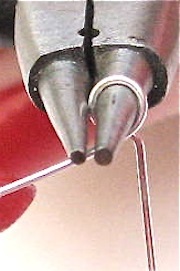 Special round looping pliers with different sized diameters along the pliers jaws will produce various size loops. 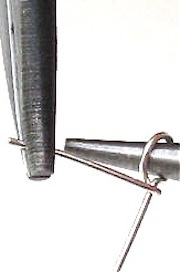 Stepped diameter mandrels can be purchased which will also produce even loops. Swanstrom pliers make a wire looping pliers kit with a number of attachments that will produce loops as well as beaded jewelry chains.